All cartoons are posted with the artists’ express permission to Pick Wayne’s Brain. Q Let me go back to the Americans. Two-thirds of Americans say it’s not worth fighting, and they’re looking at the value gain versus the cost in American lives, certainly, and Iraqi lives. Q So — you don’t care what the American people think? THE VICE PRESIDENT: No, I think you cannot be blown off course by the fluctuations in the public opinion polls. Think about what would have happened if Abraham Lincoln had paid attention to polls, if they had had polls during the Civil War. He never would have succeeded if he hadn’t had a clear objective, a vision for where he wanted to go, and he was willing to withstand the slings and arrows of the political wars in order to get there. And this President has been very courageous, very consistent, very determined to continue down the course we were on and to achieve our objective. And that’s victory in Iraq, that’s the establishment of a democracy where there’s never been a democracy, it’s the establishment of a regime that respects the rights and liberties of their people, as an ally for the United States in the war against terror, and as a positive force for change in the Middle East. That’s a huge accomplishment. 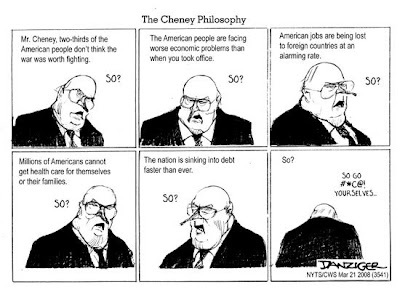 “So?”, Mr. Cheney? “So”? Is that how you feel about your role in the government of this country? That what the people you serve want of you is of no consequence? And on what exactly, sir, do you base this perogative that you claim? Because you, and you alone, know what’s best for this country? Has it ever occurred to you that you might have been wrong all these years? We all know that the war was about controlling the flow of oil and, therefore, its price. You are happy that the price is so high, because it helps make your friends (whatever countries they may live in) just that much wealthier. The fact is, Mr. Cheney, you just don’t give a damn about the American people, do you? And when he got it, his head sunk in. Don’t worry, ‘cause I’m drunken. Well, we all know Rush Limbaugh can be a real slimeball sometimes. I mean, what with the lying, and the distorting, and the racism stuff. And it’s not new with him. Early in his career, he went by the radio DJ name Jeff Christie. (Real “macho” name, eh?) And he was known to say controversial things, one of which I allude to in this song parody. (The link in the line is to a Snopes.com article confirming its veracity.) 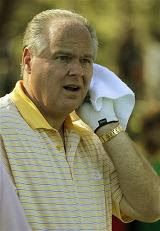 So, without further ado, another tribute to Rush Limbaugh, courtesy of Johnny Cash’s “I Walk The Line”, 1959. It’s the future. Sen Hillary Rodham Clinton has won the nomination of the Democratic Party. Well, she walked away with it, let’s say. But her problem is the people she has running her campaign. They’re the same-old-same-old, and they will lose this election for her if she doesn’t watch out. She needs to find a team that doesn’t resort to the kind of campaign tricks you see from the Republicans. Otherwise, her story could end up like this. And, as usual, I have to thank Jane for her help with this. To be president of the U.S.